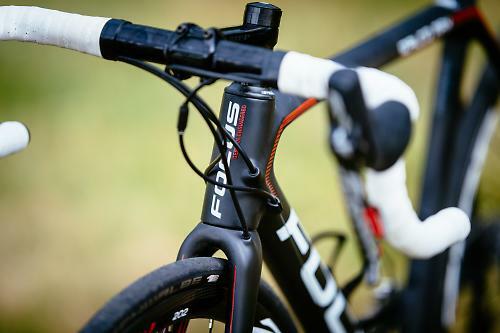 Focus Bikes have this week unveiled their brand new Izalco Max Disc, which with a 790g frame weight and 6.8kg (14.99lb) SRAM Red build comes with the claim of being the lightest disc brake-equipped production road race bike currently available on the market. 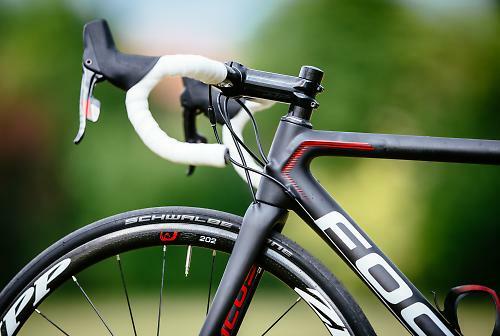 This new bike follows the launch of the regular Izalco Max in 2013 and the Cayo Disc last year. 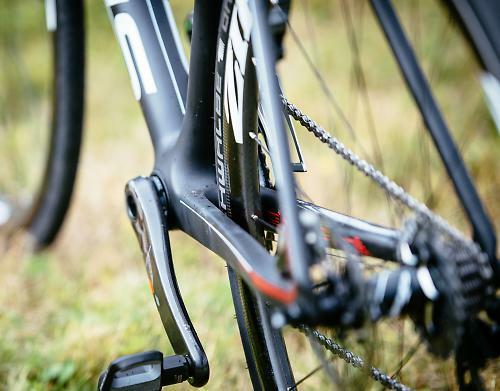 The Izalco is the German company’s top-end race bike and is used by the French Ag2r professional race team. 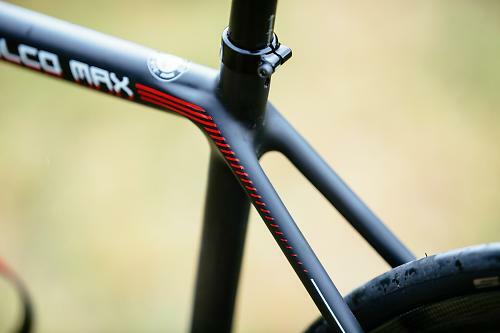 The new frame, which is loosely based on the Izalco Max introduced two years ago with some similarities but also some significant differences, weighs a claimed 790g for a size 54cm. That’s 65g heavier than the 725g Focus claim for the regular Izalco Max. There’s a brand new 320g fork as well, which is 25g heavier than the regular version. With a full SRAM Red 22 hydraulic disc groupset, Zipp 202 wheels and Zipp aluminium components, a size 56cm bike weighs 6.8kg (14.99lb). That’s bang on the UCI’s weight limit for race bikes. It’s also lighter than the 6.9kg (15.21lb) Specialized S-Works Tarmac Disc I tested earlier this year, previously the lightest disc brake road bike I’ve ridden and reviewed. Focus also confirmed that it’s possible to go much lighter, and showed a frame decked out with the same SRAM Red groupset but finished with some high-end carbon fibre components from the likes of Tune and Schmolke and some lighter wheels. That bike tickled the scales to just 6kg (13.23lb). That’s superbike territory. While the frame shares the same name and similar design of the regular Izalco Max, the new disc version has many significant changes as a result of several years of development by a team of seven engineers. Focus say it was a challenge to make this frame, and wasn’t as easy as simply adding disc brakes to a standard frame. You’ll notice the frame has external cable routing. That has come from feedback from the Ag2r team, whose mechanics prefer the simplicity that the routing provides when making frequent gear and brake cable changes. It also saves about 40-50g as well, according to Focus. While the gear cables are external on this new frame, the hydraulic hoses are internally routed, including the fork as well as the frame. Shimano’s Flat Mount open disc brake calliper standard has been used. 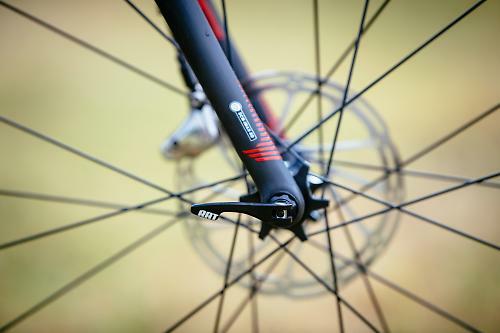 Most disc road bikes released up until now have used post mounts, a standard common on mountain bikes, but Shimano have designed Flat Mount specifically for road bikes. It’s a more compact and aesthetically pleasing approach, and there are a few advantages. One is increased clearance where it’s mounted on the chain stay, which has allowed Focus more freedom with the seat stay design. The second is that the mounting bolts thread into the calliper from the bottom, passing cleanly through the chain stay, meaning there’s less chance of damaging your expensive carbon frame with post mount bolts that thread into metal inserts bonded into the frame. Focus will be offering bikes with Shimano and SRAM options, but will be speccing 160mm front and 140mm rear rotors across the range. Focus feel strongly that a larger front rotor is desirable as it disperses heat better. I had an interesting chat with the Focus engineers and they reckon that bigger riders, in the 100kg region, riding mountainous terrain, should look at even bigger front rotors, up to 180 or 200mm. 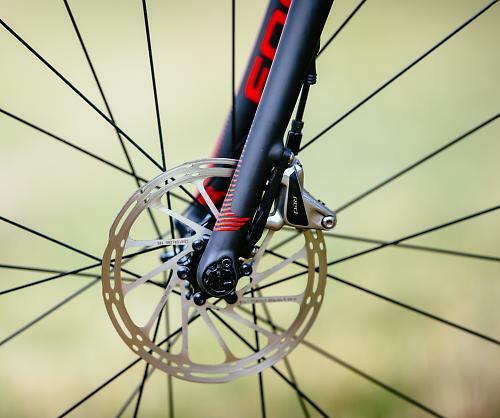 It’s common in the mountain bike world to increase the rotor size if you’re riding in the mountains or want greater braking performance with less potential for heat buildup, so I fully expect to see the same moves happen in the road market as the disc brake technology matures. One of the biggest differences with this new frame is the use of the German company’s Rapid Axle Technology (RAT) thru-axles at both ends, with 15mm in the front wheel and 142x12mm at the rear. We first saw this new thru-axle system at Eurobike last year where Focus debuted it on their latest Mares cyclo-cross and Cayo disc-equipped models. A quick recap on RAT. Focus say alignment of the calliper and rotor is a key parameter with using a thru-axle rather than a conventional quick release system. To help alignment when changing wheels, the dropouts have ‘integrated pockets’ that guide the wheels into place. The thru-axle aligns in the opposing dropout with a T-bar-shaped pin, and the lever is then turned 180 degrees and closed. Wheel changes are very simple and, more importantly, very swift with this system. 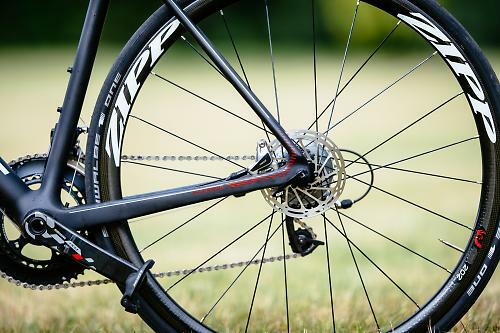 Focus let on that they reckon the next generation of disc brake road bikes will use a 12mm front axle, which saves a bit of weight compared with a 15mm axle. For now, most manufacturers are going with the 15mm standard that is widespread in the mountain bike world. 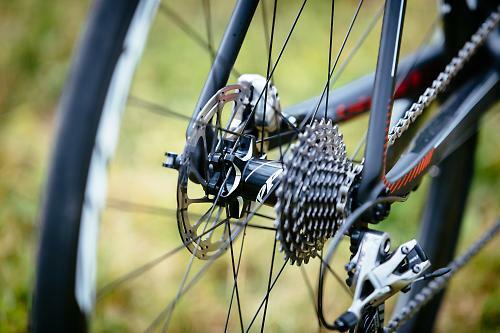 Another big change with the new Izalco Max Disc is in the geometry. While most of the numbers are the same, the chain stays are 10mm longer. They measure 415mm. 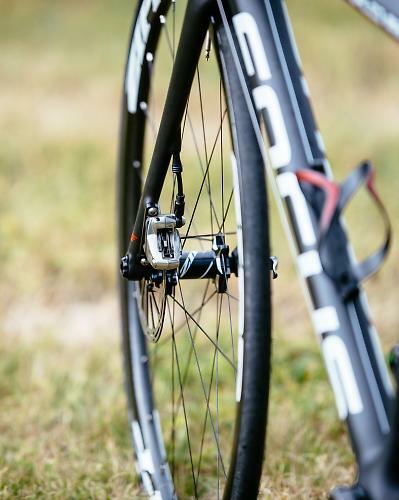 A typical race bike has short chain stays (in the 405mm region) but when you increase the rear axle width to 142mm, and add a disc rotor to the rear hub, you encounter chainline issues. 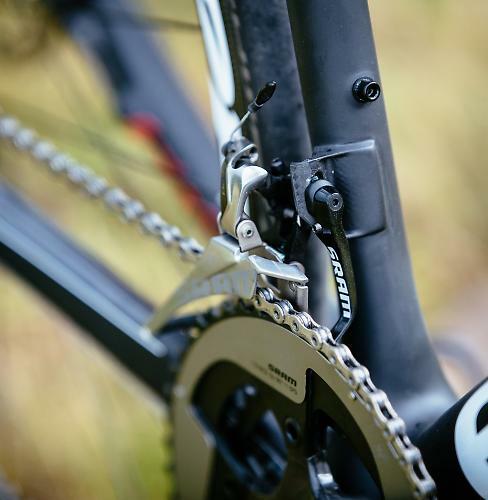 Shimano actually recommend a minimum chain stay length of 415mm, so that’s what Focus have used. While Specialized have developed a rather cunning, and patented, rear hub design to move the cassette inboard, allowing their S-Works Disc to maintain the same short chain stays as the non-disc version, Focus have more pragmatically taken the decision to simply lengthen the chain stays. 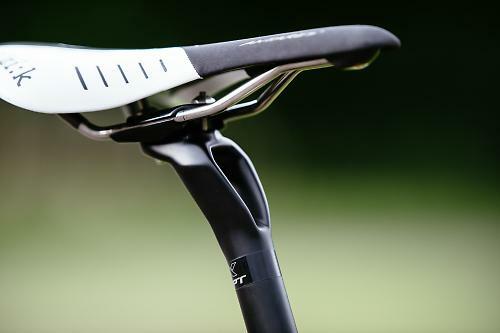 The new frame provides the same stiffness as the regular version, but comfort has been increased according to Focus. The rear brake bridge has vanished and this has freed up the seat stays to provide more compliance, and Focus have modified the carbon fibre layup to enhance the ride smoothness. To retain the same stiffness as the regular frame, they've increased the size of the top tube and beefed up the chainstays. It’s the same with the new fork, which has the same narrow design of the regular fork but with wider spacing for tyre clearance and increased wall thicknesses. Focus have also developed a new seatpost. Called the Concept CPX Plus post, it weighs just 195g with a 27.2mm diameter and 340mm length, and features a carbon layup and hollow section that allows it to absorb vertical vibrations. 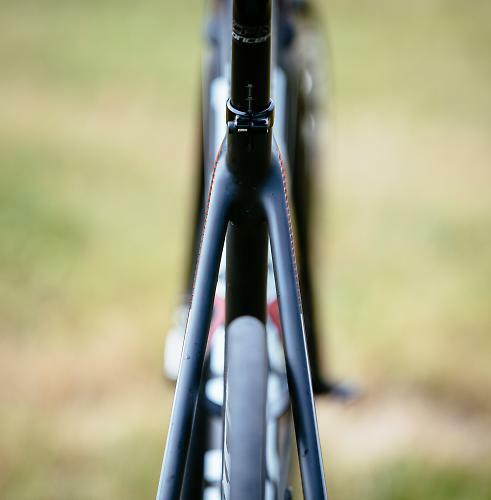 The new frame is built using the same SSPS (Stable Stiffness Per Size) method as has been used on the Izalco and Cayo for many years, with a different layup for each frame to optimise the weight and stiffness for tall and short cyclists. Also providing a comfort boost is the option to be able to run wider tyres, as the frame and fork will take 28mm tyres. Production bikes will be specced with 25mm tyres. I can’t think of many other top-end race bikes that can accommodate such wide rubber; 25mm tyres are tight on my conventional race bikes. Despite the offering of this bigger tyre clearance, Focus were keen to remind us it’s a “race bike with disc brakes, not an endurance bike”. What models are available and when can I buy it? There will be two models at launch, the €5,999 Izalco Max Disc Red or €3,599 Izalco Max Dura-Ace, along with a frameset option too. We’ll confirm UK prices. A frameset will be available as well. I had the chance to spend a day riding the new bike and will report my first impressions in a separate article soon.